A top stock of eight cards is required lor this effect. The four Kings are on top of the deck followed by the four Aces. A very practical way of getting this stock would be to use some early planning. 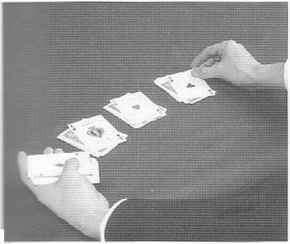 Near the beginning of the act, perform a four Ace trick and return the Aces to the top of the deck. Perform a couple more tricks that will not disturb the top four cards, finishing up with a Card Revelation in which it is necessary to look through the deck apparently to find the selection. At this time, cull the four Kings to the top of the deck. Give the deck any series of false shuffles that will keep the top stock of eight cards intact. At the completion of the false shuffles, pause for a few seconds and patter about the possibility of controlling cards with a Riffle Shuffle. Turn the top four cards face up revealing the four Kings. Place the Kings face up on the table, off to the side. Pause for a few more seconds, and get a break under the four Aces on the top of the deck and triple undercut them to the face of the deck. Take the deck from the left hand into the right hand from above, and reach forward and drop about one-quarter of the deck from the bottom onto the table. 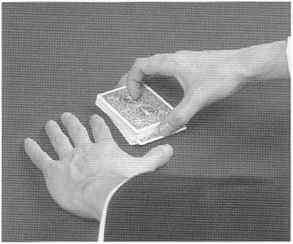 Moving the right hand back towards yourself, drop two more quarters of the deck and return the fourth packet into the left hand in dealing position. Get a break under the top three cards of the packet held in the left hand. With the right hand, pickup one of the Kings from the table and turn it face down and use it to scoop up the other three Kings, still face up. While picking up the Kings, pivot the packet over, bringing one King face up on the top with the other three Kings face down under it. A Packet Switch is now performed. Bring the King packet in the right hand over the packet in the left hand and simulate pulling the face-up King with the left thumb from the right hand packet onto the left hand packet. Actually the entire King packet is taken on top of the left hand packet while the right hand moves back to the right taking the three card packet that was above the break held by the left little finger. The left thumb now goes under the face-up King on the left hand packet and pivots it face down. 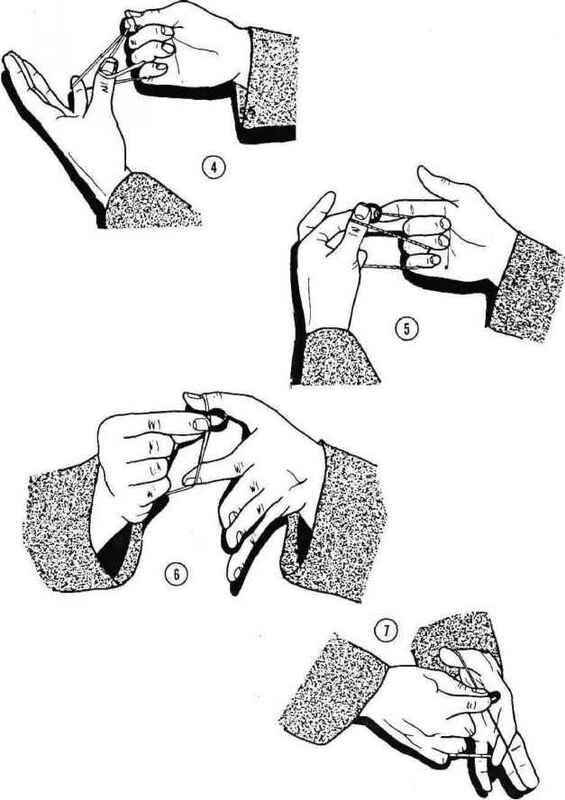 Do this with the left hand only; don't bring the right hand near the left hand packet. 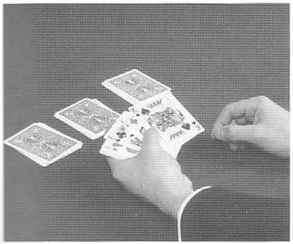 packet, and the entire deck is pulled back in front of yourself and left on the table in readiness to perform a tabled Riffle Shuffle. 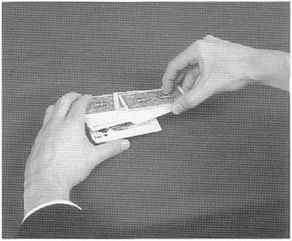 The left thumb hits the back edges of these cards and tilts them upwards, replacing them on the bottom of the deck, but they are now reversed. (See Photo 2) Square up the deck and let it drop back flat on the table in readiness for one more Riffle Shuffle that is used to bring the reversed Kings and Aces to the top of the deck. At this point, the four Kings are on the top of the deck and the four Aces are on the face of the deck. The four Kings must now be brought from the top of the deck to the face of it during a Riffle Shuffle. One method of doing this is Roy Walton's, and will be found in Karl Fulves' "Riffle Shuffle Technique, Part One" on page 29. Briefly described here, it is basically a variation of the Zarrow Shuffle called "Triple Cut Zarrow." The right hand cuts the top half of the deck to the right, and you commence to riffle the two packets together. The right thumb holds back the four Kings and allows them to drop last to complete the riffle. Complete the "Zarrow Shuffle" by stripping out the left, packet and inserting it under the four Kings. Before the deck is completely squared up, cut off the four Kings and place them on the table, follow by cutting off the original bottom half of the deck and placing it on top of the Kings, and finally the original top section of the deck goes back on top. Square up the deck, and it will be seen that the four Kings are now on the face of the deck with the four Aces directly above the Kings. Secrets," on page 52, which is very briefly described here. Cut the top half of the deck to the right. Start riffling off the cards from the left hand packet by running the first nine cards, that is, the reversed Kings and Aces plus one face-down card. Then riffle off a blockof cards from the right hand, then riffle off the remain- ^^BB^^^BB^^P^ p ing cards evenly. 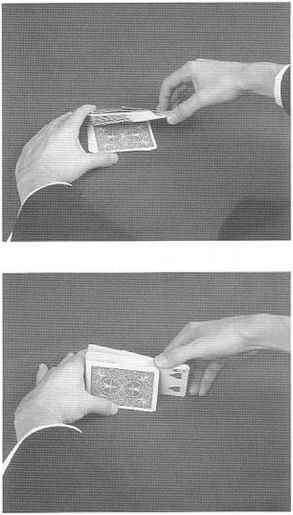 In squaring tip the ^_ h cards, they are not pushed quite flush, as if a "Push-Thru Shuffle" were about to be performed. With the cards still slightly jogged, the right hand lifts up the top half of the deck and places it about an inch forward of the rear half. The left hand now picks up the rear half and places it on top of the forward half. The right hand continues as if doing a Running Cut, by cutting off the top portion down to and including the block on the right side, and again goes forward as the left hand picks up the bottom half and places it on top, and now actually square the deck up. The top card of the deck is now an indifferent face-down card, followed by the four face-up Kings, then the face-up Aces, and finally the remainder of the deck face down. In a tabled cut, the right thumb lifts up on the jogged card and cuts all the cards below it to the top of the deck. A face-up King will appear on the top of the deck. Pause for a second, and let the appearance of the King sink in. Quickly give the deck three Slip Cuts, cutting three packets of cards to the table with a face-up King on the top of each. Hold the packet with the Aces in your left hand. The four face-up Aces are under this face-up King. Pick each King off the top of its packet and momentarily hold them on top of the fourth packet. (See Photo .5) p Flip all eight face-up cards face down; h this is easy because there is a natural o break where the cards come together back to back. Immediately deal one of the supposed Kings to the top of each 6 of the three tabled packets. If it should be necessary for later use, the four Kings are still under control on top :he packet of cards in the left hand.